Long ago, humans would use the juice of berries and plants to sketch pictures of things like distant planets and other humans, leaving artifacts for future generations to discover and discuss. Since that time the science of paint and painting has developed and evolved. From using crude, raw materials of the past to sophisticated mixes applied by robotic sprayers today, the chemistry of paint creation and application is ever-changing. Furniture so amazing it cleans itself! Did you know that some paint can clean itself? It’s true. In 2012, scientists in Germany discovered that adding specific amounts of titanium dioxide to paint used on outdoor furniture would keep mold and bacteria from growing on the furniture. A multi-year experiment of leaving the furniture exposed to the elements in the outdoors resulted in chairs and tables that looked as clean and white as the day they left the factory. As a result, companies using the paint are armed with a new competitive advantage when advertising their products: their furniture will stay clean on its own while the competition’s furniture will not. The addition of titanium dioxide in to paint is not a new practice. 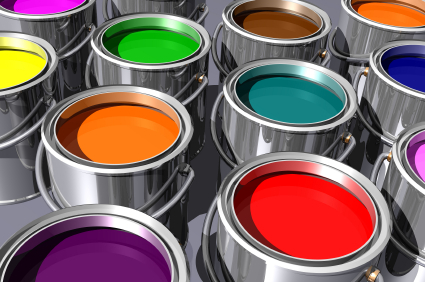 Adding TiO2 to paint was pioneered in the 1960’s by Japanese scientist Dr. Akira Fujishima. Dr. Fujishima discovered that when the TiO2 was stimulated by ultraviolet light it would help destroy the molecules that allowed bacteria and mold to grow. In 2008, scientists at the University of Miami found that this technology could be used in interior paint to repel dirt. The subsequent German research took things a step further by working with materials exposed to nature’s elements, where mold and bacteria would theoretically be more aggressive. BYK has been creating not only paint that includes titanium dioxide, but also paint additives that help stabilize titanium dioxide for other paint manufacturers, chemists, and paint professionals. BYK offers three wetting and dispersing additives (DYSPERBYK-111, 118, AND 180) that each offer the paint professional options for stabilizing TiO2. These products have helped chemists and paint professionals alike create new paints and coatings capable of solving problems like never before. What does this mean for the paint professional? These is just one example of recent chemical innovation that is changing the products and services professional painters can offer customers and clients. Where paint was once thought of as simply being a decorative or protective complement to the item on which it was applied, new developments in the chemistry of paint are allowing coatings to offer features and unique qualities all on their own. And while chemists have long been trying to find ways to make paint retain its color and not crack over time, new ideas are addressing not only those core properties of paint, but also researching new and exciting theories that lend additional functions, as well. What will the future hold? Will paints eventually autonomously change thickness as needed depending on exterior environmental conditions? Will paint become a source of insulation, power conductivity, or radio dispersion? No one can know for sure. But in the coming weeks we will be examining all of these developments here at the Chemistry Corner. In the meantime, feel free to ask a question about paint chemistry or leave a comment below for us to address in a future article. We look forward to you visiting again for the next edition of the Chemistry Corner!